Please add our site you may need another free resume later on. After bookmarking us, please let your friends know by e-mailing this page to them. They will appreciate you sharing and they can also pickup one of our free resumes. To quickly download a free template--just click save as--then save on your Desktop. You will find the resume very quickly on your desktop so you can edit it anytime at your convenience when you have the time needed. Try making your information on your resume stand out, use bullets like resume 2 or 3 above. That hiring manager will scan a resume very quickly, and bullets are your best friend. Your qualifications, when the hiring manager just glances at the resume, just pop right out. After all, the end result you are after is for your resume to be a complete success. We also would like you to accomplish your job search success, and that includes having a really great resume in your hands when you leave our website. I am dedicated to helping you find what you need, and I really hope that you will get everything you need here to help you out. 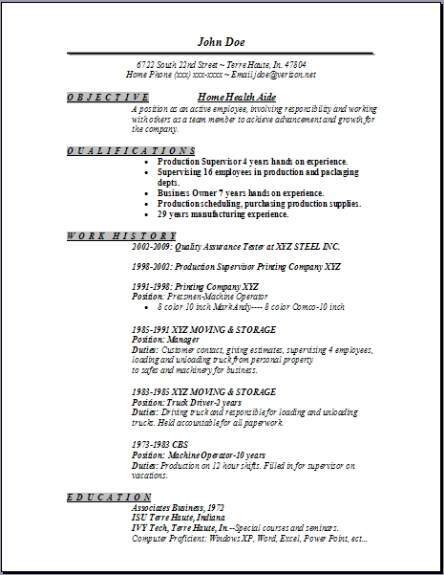 Share with your friends, then try visiting a lot of our other really great resume pages for more helpful information gathering. This job will be providing routine mostly individualized healthcare, for instance dressing wounds and also changing bandages. 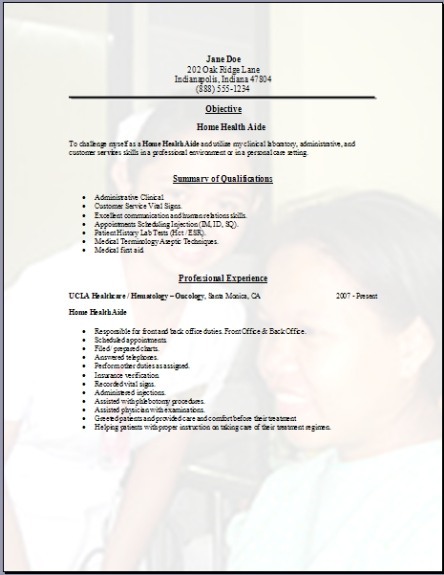 This position also consist of applying topical type medications to elderly persons, convalescents, and also people with certain disabilities, either at the patient's own home or in a specified care facility. You must then monitor or report any changes in their health status. You may also provide various personal care like assist with bathing, help with dressing, and any grooming of the patients. Home health aides will typically need to have a high school education, although there are positions that will not require it. Those of you wanting to work in a certified home health angency or a hospice agency, will need to complete some formal training and then pass a very standard test. Employment for home health aides is growing much faster than other occupations. This occupation will grow a huge 40 percent from 2016 to 2026. Since the baby-boomer and the elderly population grows much faster these days, there is a great demand for home health aides and this demand will definitely continue to rise very fast. Dig through all of our information on this website until you can find something of help to you. 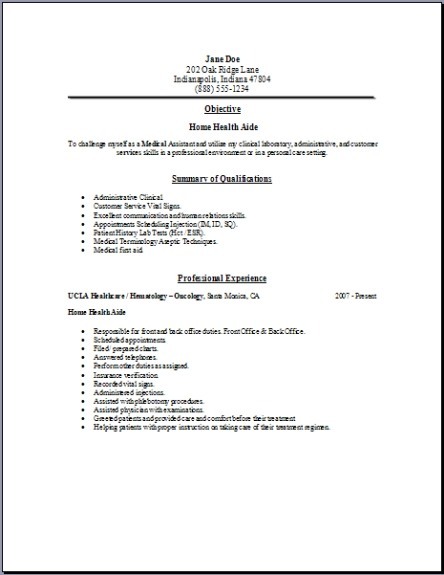 There is an overwhelming amount of resume information here so check all the different resumes on the other pages. You can use any design you like. I wish you the greatest success. Please share with your friends.